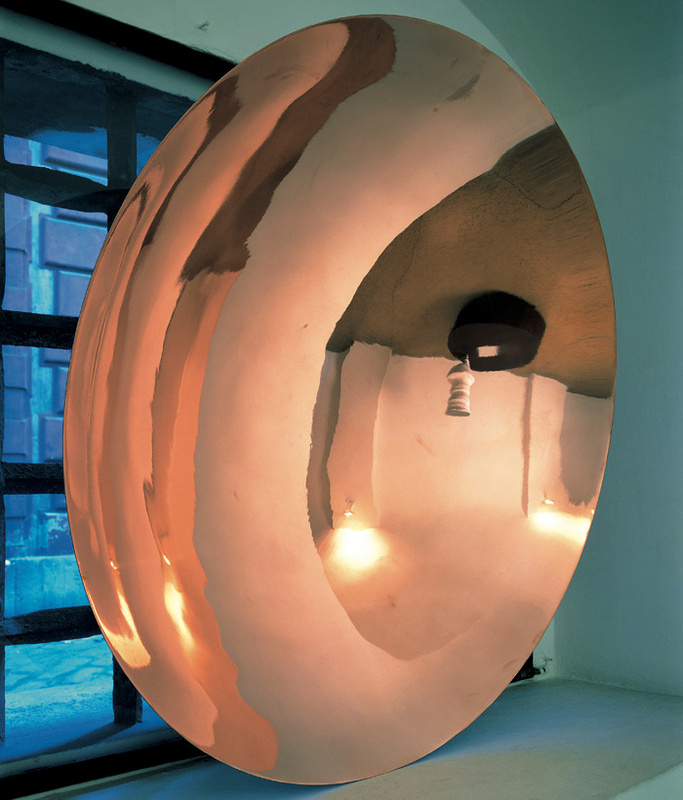 Marco Bagnoli/Madrigali, Galleria Locus Solus, Genova 1988. Francesca Pasini, Specchiarsi nel disco solare, in: “Modo”, Milano, n. 121, marzo, 1990, pp. 62-63. “Janua Coeli, the Sun-Door is variously described as the “strait gate,” the “severing truth” and the “point on which contraries turn.” This door is the passage from that which lies below the Sun to that which lies above, from the duality of manifestation to the unicity of the Godhead. The created world, born into duality, is of necessity the realm of contraries, of pairs of opposites – hot and cold, north and south, night and day. The lower self, having “eaten of the fruit of the tree,” is also such a realm, possessed of fear and hope, love and hate, weal and woe. The conflict of the pairs within the world will persist until the world’s end, but the conflict of the pairs within the self can be overcome. This liberation of the lower self can only be effected through the higher Self – the Sun-Door within us – for there is no side path, no other way “under the Sun.” Seated in its ground, the higher Self persists above the fray in a state of invariability, in the coincidence of contraries, in the reconciliation of the pairs. The passage through the Sun-Door is precisely the passage from duality to unity, from the identification with the self trapped in multiplicity to that with the Self seated in unicity. The door is not open to all, but stands closed and guarded. The qualification to pass through the door is to know what one is. As Coomaraswamy clarifies in his essay “The ‘E’ at Delphi,” the question that will be asked of us is “Who art thou?” At that moment, everything will hinge on our locus of self-identification, whether in the lower self or the higher Self. If the answer given is any personal name, then the door remains closed and barred to us, and we remain “below the Sun,” condemned to the “factors of time.” If the answer given is “Thou,” then the guardians will welcome us, the door will open, and we may pass through, “beyond the Sun,” to our deliverance and consummation. The way that leads through the door is necessarily one of gnosis, not of merit; our liberation cannot be won by works or even by virtue, as necessarily dispositive as these may be. The door may be passed through before physical death, and indeed, this is the best course; otherwise, at the ending of our lives, the “moment will be upon us” and the question will be posed.